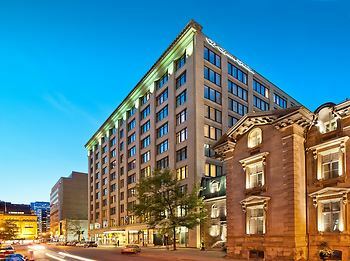 Le Square Phillips Hotel And Suites, Montreal, Canada - Lowest Rate Guaranteed! A stay at Le Square Phillips Hotel And Suites places you in the heart of Montreal, steps from Sainte-Catherine Street and Phillips Square. This family-friendly hotel is 0.3 mi (0.5 km) from The Underground City and 0.4 mi (0.6 km) from McGill University. Great stay. Roomy suite. Good breakfast. Enjoyed the gym. The toilet paper could be of a higher quality and MUCH softer. Would be nice to have a bar!! The beautiful big clean suite. The excellent location. Everyone was very professional, friendly and helpful. Everyone, without exception, was helpful to my frail elderly Mother. We had the use of a disabled suite which was wonderful. However, for someone who needs assistance showering, a moveable shower head with hose would be good. It was difficult wihtout one. A suggestion. I do not have anything to complain about. Convenient, efficient and large areas! Love the architecture! We do find the breakfast selection mediocre.....even the croissants and bagels - a sad comment for a Montreal venue! The hotel suites are quiet, comfortable, and convenient. The location and staff are great. Excellent value.